As you've probably noticed, resources are important. They allow you to build up your castle, do your research, train troops, etc. Loads of us, spend hours gathering in order to gain something afterward and others will just attack other castles to get the resources without having to spend hours gathering. Another way of getting the easy resource is by hitting dead castles (especially those that aren't c25 with max vault). 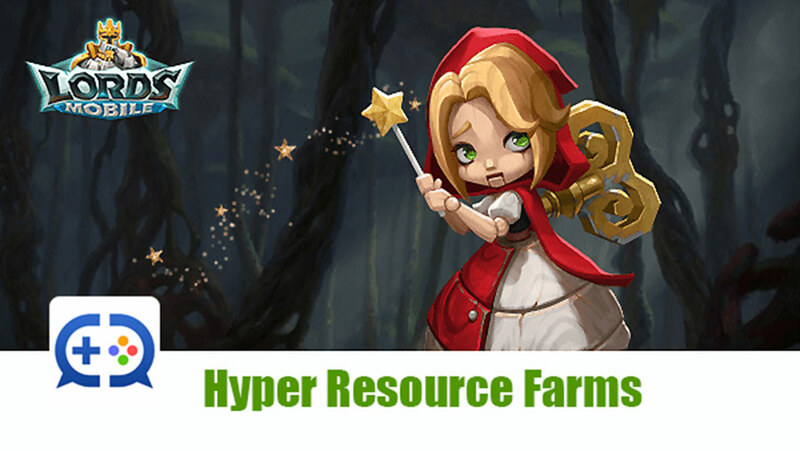 But these days, we see the rise of hyper farms. Every guild needs hypers especially those big warriors guild that can easily spend 1b or more RSS on a fight (not talking about the Baron or Emperor battle, the RSS spend it is just crazy!). This will be a small walkthrough on how to build a hyper account. There are a few steps to follow, so let's get into it, shall we? Pick a RSS building (quarry [stone], lumber mill [wood], mines [ore], farm [food] and manors [gold]) and max it out to lvl 24-25. Barely in mind that if you are a hyper in food or gold, you have little to no troops. Although I've seen hyper farms with quite a large amount of troops and they do not have a gold champion gear, to begin with! So it is possible to be positive in food (I'll write a post about it in the future). 2. Research (regardless of the RSS you chose either it's wood, ore, stone, or food, you need to max out its respective research). All researches must be lvl 9 or lvl 10 (if you've unlocked Academy 25). I'm a t4 player, so my economy tab is max out, but hypers should focus on them too at least up to lvl 9 and then max it out (if you have the academy at lvl 25). For gold hypers, "Gold storage I" and "Gold harvesting I" should be lvl 8 [for lvl 9, you need Academy 25]. As you work your way up in research, you should focus on getting some HEROES up to gold. Needless to say, that aside 2 heroes, they all offer atk boost so it's a must to have them whether you're a hyper or not. 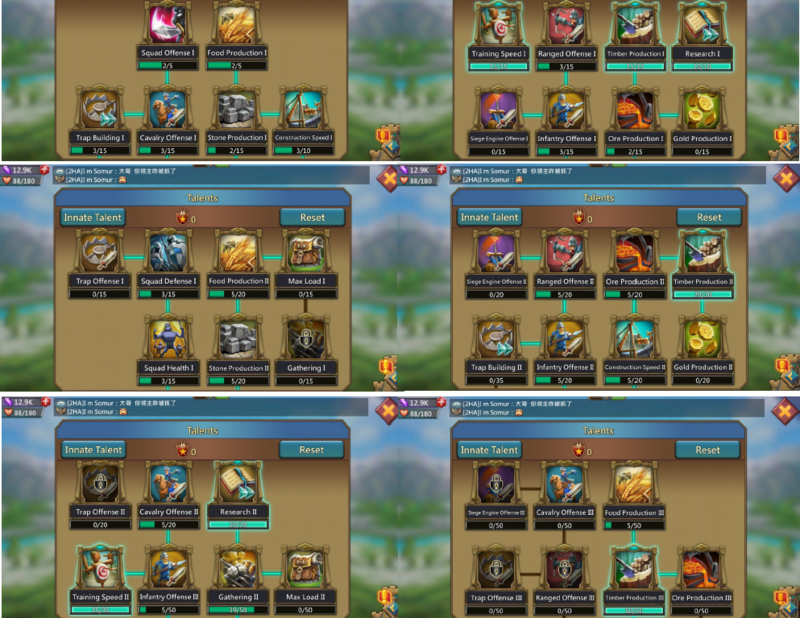 They are the new addition to the game, and if p2p rushed to get some of them to an elder stage for their Atk boost and other aspects, f2p and hypers can highly benefit from them as well. *Familiars are at max level ie Elder and lvl 10. If you've maxed out your research and your heroes are the gold grade, with all buildings at level 25, your production will be around 2m RSS per hour (and all this without any talents whatsoever. If you set your talents tho, your production will be higher and reach 4m RSS per hour, which is huge when you think about it. This is an example of talents set. This is my main account, I needed to be able to train troops as well as to research and produce rss in large amounts. If you have an alt account, let's say wood/gold, you should max out « Gold production » instead of the second part of the tree which is military.